Two-day event began with a call to ban Trident missile system from Scotland. The Labour for Independence (LFI) group is holding a conference this weekend to set out a course for the party in an independent Scotland. 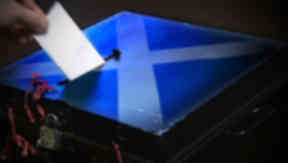 Over two days, members will examine what Labour policy in Scotland could become in the event of a Yes vote in the 2014 referendum. LFI leader Allan Grogan said the event, at the STUC in Glasgow, was an important step on the road to a "better future" for both the Labour Party and Scotland. He said: "It's very important for the people of Scotland to see that a Yes vote doesn't just mean we will be going down a one way road. Rather a Yes vote is the starting point to choosing how best we shape our nation." The event marks the first time the STUC has hosted an LFI event, and the group's chairman Alex Bell believes the location of the venue is just as significant as the event itself. He said: "This is a strong message as to how a real Labour Party in Scotland would operate. It's the kind of venue Ed Miliband should take his focus groups to." The conference opened with a call to ban the Trident nuclear missile system from Scotland. Other issues under discussion will be the group's position on NATO and development of policies in education, health and infrastructure. The group was set up by Mr Grogan in response to what he called "the refusal of party bosses to acknowledge support among a sizeable number of Labour party supporters for independence". He said: "Eventually Labour is going to have to acknowledge there are voters in the party who will back independence." Around 100 people are expected to take part in the conference.